For as long as there has existed a 'lower class', a 'lesser gender', a 'sub-species', a 'deformity of the mind', there's been division within society. These partitions are central to any attempt at structuring power or delegating agency between peoples. Without them, power would be constantly challenged, even overthrown. So it comes as a surprise to me when the benefactors of these divisions — those whose notions of identity and existence are on the 'right' side of them — are oblivious to their presence. They are surprised, even deeply wounded, at the very suggestion that the divisions exist. In our current global climate, minorities and oppressed communities are branded as being 'divisive' when attention is drawn to the void which exists between those with power and those without. This allegation stands firmly on the understanding that our 'unified strength' against a common enemy will bring about the change we so passionately fight for. This isn't wholly incorrect. But it is often forgotten that the terms by which we define 'strength' and 'unity' impact the efficacy and suitability of our actions. Often when the case is made that our strength lies in unity, the assumption is that all parties are to unify with the majority, that 'all our differences should be put aside' and those of lesser power should fight for equality in a way that those in power see fit. This is inherently problematic, and when disenfranchised communities denounce this approach as the perpetuation of the current status-quo feigning as revolution, they are, again, said to be 'divisive' and to be actively impeding progress. It's rarely the people who see me as an 'angry-black-non-patriotic-millennial-SJW' woman who's 'anti-free speech' and 'preaches political correctness' that accuse me of being divisive. Rather it is my well-intentioned 'allies', the self-proclaimed 'intersectional' feminists who preach of our 'unified strength'. In my experience as a young queer black woman, I encounter this reaction, more often than not, from black men, the extended LGBTQIA+ community, and white women — i.e. from communities that already experience forms of discrimination and are my nearest potential allies. Of course this doesn't relinquish blame from those who occupy positions of power. But it's worth noting the dichotomy of maintaining certain structures of power (those that benefit us individually) while seeking to dismantle others. 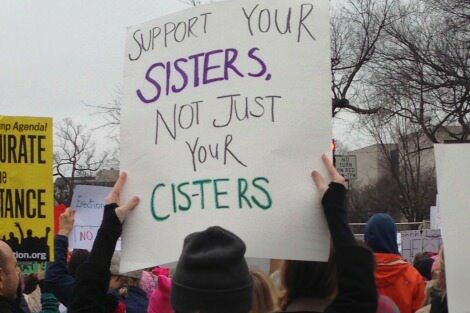 "If we fight for women's rights but neglect everything that makes 'womanhood' diverse and dynamic, then what we get is 'white supremacy — but now, with gender parity'." The 'divisive' argument creates a hierarchy of 'whose oppression is most important' and thus 'whose rights should we fight for first'. If we fight for black lives but don't include women and queer lives and the dynamism of black existence, then what results is a black capitalist patriarchy. Nothing changes except for the colours of the faces in power. Likewise, if we fight for women's rights but neglect everything that makes 'womanhood' diverse and dynamic, then what we get is 'white supremacy — but now, with gender parity'. That doesn't help anybody but white women. To pretend it does is to maintain the illusion that we are the same, that there is no division, that we are now equals. Frankly, it's disheartening and exhausting when everything that shapes your identity is 'divisive', when your very existence is 'divisive'; when your needs must always come second to a 'greater agenda'. Learning to navigate this terrain on both sides of the divide could be the saving grace in cultivating our unified strength. I certainly don't have the answers, but as a starting point, I pose a potentially 'divisive' approach: that any push for social justice should be led by and accessible to those on the lowest rungs of society. For the hierarchy to be tipped on its head, so that the needs of the most marginalised are met first. The unified strength we idolise stems from an understanding that by 'putting aside our differences' we are robbing ourselves of truly dynamic revolutionary change. Moreblessing Maturure is an actor, writer and creative director of Sydney-based FOLK Magazine, an online platform dedicated to showcasing artists of colour and their work. There are parts of Black Africa where, if you are a gay man, they could, often would, put you to death. Several African clerics of various persuasions have supported this. I am not sure how such African nations and clerics would deal with a lesbian or transexual. Your own history is a blank to your readers, Moreblessing, so, apart from noting your excellent rhetoric, there is not much more I can say. I have certainly been part of a minority but it was a rather privileged one and I certainly wasn't oppressed or disadvantaged. I have seen disadvantaged and oppressed minorities in Post Independence India: they were what were called Outcasts, a brutal and horrifically realistic description, both religiously and practically of where they stood. Bizarrely enough from your vantage point, High Caste Hindus, such as Nehru, India's first Prime Minister, were well aware of the Outcasts horrific plight and his Congress Party abolished caste legally and provided penalties for discrimination and quotas in education and employment to advance them. Several were raised in status and life this way. Being gay in traditional Hindu society is not a cause of discrimination. It is, like the traditional Italian pretence that gays don't exist and letting them get on with their lives, a fairly mature approach to me. In the Anglophone world we don't seem to traditionally have had a mature and accepting ethos. Gay? So what? I think it's far worse than the Anglosphere in Black African countries such as Uganda. Very dynamic writing, Moreblessing. The poet Adrienne Rich said "Ways of thinking about women and men usually stall in a 'maze of false dichotomies'." Your article shows that the differences between women are also relevant. The publicity about the increasing number of women graduating from university, for example, should be linked to the significant number who do not complete high school. Single mothers in low-paid jobs face enormous challenges. As pointed out in the article, black and lesbian women also face great challenges within society. And, of course, in caring for those on the lowest rungs of society, there is no distinction between male and female in that 'category'. The controversy is not that justice is indivisible but over the reasons adduced for asserting that it is missing from a particular situation. If I, or "black men, the extended LGBTQIA+ community, and white women" (among others), have to acknowledge rights to a black queer woman because, to all of us, she in her complexity is undeniably real, should a foetus have rights over its mother because, to her, it in its complexity is undeniably real? Should a child have rights over each of its biological parents because, to each of them, it in its complexity is undeniably real? If Moreblessing wants to impound rights for herself because she is real, must she also concede rights to others because they are real? If anyone wants a real live example of the truth expressed in this article, I refer you to the ABC's Radio National program Background Briefing, episode entitled: "Sis, we've got your back". (see transcript: http://www.abc.net.au/radionational/programs/backgroundbriefing/sis-weve-got-your-back/7495604#transcript). It was aired Sunday 12 June 2016 and repeated Sun 11 Dec 16. This program shows the hard time some Aboriginal women in the Illawarra (where I live) have been given, by some men leaders in the Aboriginal community because the women dared speak up about Aboriginal male paedophiles. These women have been roundly criticised by [male] leaders within their Aboriginal communities for being divisive and bringing discredit on their community by highlighting the plight of Aboriginal children who were being sexually abused. We do well to accept, as Moreblessing intimates, that "divisions" or "groups" are the sine qua non of living together as humans. Groups/divisions are inevitable. That we are born into a 'family' with a father and mother immediately creates a "group" or "division" between "me and my family" and the rest of society. Also inevitably there will be conflict between groups/divisions. We are not entitled to 'agree' to some groups/divisions existing because it suits us, but wave away other 'groups' or 'divisions' because it does not suit us to recognise them (to paraphrase Moreblessing, be "surprised, evenly deeply wounded, at the suggestion that the divisions exist").